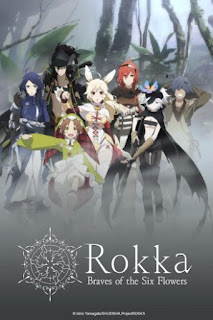 Rokka -Braves of the Six Flowers- (Japanese: Rokka no Yuusha) is set in a "Aztec meets Greek/Roman Empire" world. Adlet Myer is the main character, an 18 year old who has a nice hair colour combination going on (anyone else agree?) and is the easygoing/carefree type until things get serious. He claims to be the strongest man in the world and wants to be chosen as one of Six Flowers by the Goddess of Fate. The Goddess chooses six strong people who fight together to defeat the Demon God who reincarnates over time. But to make their journey difficult, fiends are summoned to defeat the Six before they reach the land where the Demon God can be found. There is a brief history of how the Six came to be chosen and their journey to defeat the Demon God after Adlet is introduced to us. Continue on with the anime (not that much further), and it kind of has a RPG feel to it. Don't kill me when I say it kind of reminds me of FFXIII (since it's the only Final Fantasy game that has a similar story, but if you haven't played the game, the group are marked as L'Cie, and must fulfil a mission based on the thoughts they're shown in their head) when they're chosen as one of the Six Braves and set out to fulfil their mission. Add in fiends which are sent out to kill the Braves, and don't you agree with me about the RPG element? It does make for an interesting story as it allows different types of characters to feature in the group and affect the story, and how effective the team is when they fight together. I like the direction in which this is going, and you won't feel bored whilst watching any of the episodes. There's plenty of action as the ever-growing group continue on towards their battle with the Demon God whilst finding the remaining Six and overcoming any obstacles they encounter. The RPG element comes in again as each of the Six have different fighting styles. Adlet's nature brings comedy when needed, and adds to the battles. The other characters bring in the remaining elements to the anime to make it what it is. So if you're looking for more of a historical-based action anime with a hint of RPG, Rokka -Braves of the Six Flowers- is the one to watch. Anything else: Adlet or Goldov?